it must be Africa (Ceuta). Well no, actually. It’s not. Not even close. That holiday mobile I mentioned the other day. Not only is it noisy, but it emerged with split time keeping. Having been half an hour out, it arrived here with two lots of time to offer me. The right time. And the wrong time. The wrong time was labelled London, which was vaguely appropriate. I looked at the phone, but failed to work out how to change it, and hurriedly thrust it into the hands of the Resident IT Consultant. Let him work for his name, I thought. I am not ashamed of my technical shortcomings. It took him half an hour to decide it is really quite tricky. As soon as it wasn’t 2.15 or London, it was 3.15 in Africa. He accused me of having got an app with peculiar settings. I didn’t even know the clock could be an app (I have yet to understand this app business), so how could I have imported said app to what is his old phone? Eventually he said I could call it Gothenburg. I was happy enough with that, even though it is not where I am. It was easier to identify with than Ceuta (which I am sure is a lovely place). Somehow. But when he made it to be 3.15, we were back in Africa. Goodbye Gothenburg. 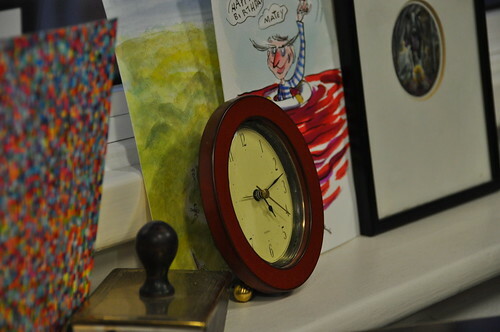 After a most lengthy consultancy, I now have a clock showing the correct time, and no place at all. Perhaps that’s why it is fairly relaxing. There’s no escaping the jiffies. There was one waiting for me at this end, and doesn’t it look nice? 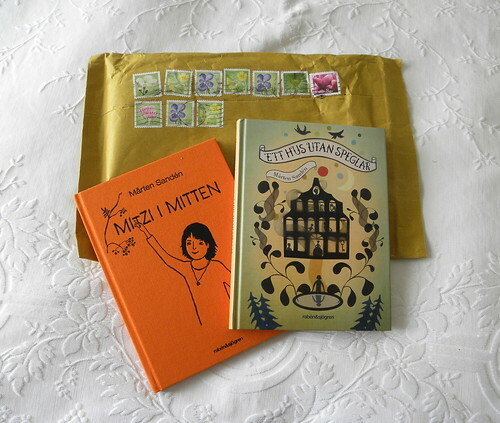 I heard ages ago that Mårten Sandén’s book Ett hus utan speglar was going to be published in English this summer. I am hoping the translation is winging itself over here as I blog (because I was a little late in thinking about this). But so I could see what the original looks like, Mårten very kindly supplied me with a copy. Actually, it was his dad. He’s pretty good at sticking on stamps, wouldn’t you say? So, I am looking forward to seeing what Mårten’s A House Without Mirrors will be like when it has been exported. And I will let you know. Well, it sort of depends where you take me, doesn’t it? What it really means is that DSB – Danish State Railways – need a translator who does not have Danish as their mother tongue. Before the train muddle we’d been on a couple of planes, the Resident IT Consultant and I. It’s a blessing, really, that our electricity bills are so big. (If you are reading this dear, of course they are not…) We hardly ever shop at T*s*o, so it’s primarily the electricity which made our ‘free’ flights possible. And I learned such a lot about the stewardess’s new boyfriend with the seven bedrooms. The BA mozzarella wrap kept me going all the way ‘home’ in the end. Though I’ve never quite grasped why they are so cautious with their meatfree food. It was assumed I’d be wanting the dead bird. The loving couple and I sat in the coach displaying a picture of a man picking his nose. I believe that is why it is often easier finding free seats in that part of the train. People are put off by the finger. After having stared at it for a long time, I worked out it’s someone trying to shush you. Not digging out snot. Just to be safe, the Resident IT Consultant and I conversed in whispers, and when I needed to switch on my very noisy holiday mobile (to call the vet for a car) I stepped outside for a minute. Outside the nose-picking zone, not the whole train. In Ängelholm we passed a train, bearing the name of an ancient easy listening singer, going in the opposite direction. None of this Flying Scotsman business when you can have Östen Warnerbring. Tyrolean hats come to mind. We finally got to our penultimate destination, where we swapped Stilton and oatcakes for a Saab. Mr and Miss Vet left a party to deliver us a car, while Mrs Vet sensibly stayed and had fun. We had narrowly missed Miss Vet two days earlier as she was ‘held hostage’ at Manchester Airport in between flights. With a bus strike just beginning, we were very happy to have some other means of transport. (I forgot the broom, again!) We stopped at ICA Maxi for fermented milk and other necessities, after which the poor Resident IT Consultant most uncharacteristically collapsed into bed. It was only later I discovered what his chosen reading matter had been. A book with the title Why Most Things Fail. Is it in the post? Do you recall that post a while back, where I whined about the non-appearance of a book? It had interesting effects on people. I received a really worried email that morning from one publisher asking ‘it wasn’t me, was it?’ before apologising profusely for a fault not committed. If you can call it a fault. At the opposite end I had an email from an author asking if the latest proof had arrived. And another, asking had it arrived now? Some digging ensued, and I was asked for my address so that I could receive one of the author’s own proof copies. But I’d gone out for the rest of the day. My mobile (which can receive emails now…) was switched off, because it had to be. So if you happened to see your neighbourhood author out at the postbox late one night, it will have been my personalised proof, getting itself posted before midnight, when – apparently – it would have turned into a pumpkin. Don’t tell me I don’t know some very kind people. I loved this book! Anthony McGowan has written the most perfect badger book imaginable, and it’s dyslexia friendly. It had been compared to Kes, which alarmed me somewhat, although I did realise it was meant as a compliment. For a dyslexia friendly story, this is a long book. Sometimes I hesitate to recommend the rather short books to normal readers, simply because the book will be over almost as soon as you’ve begun. This being 130pages – and so very good – I think everyone might want to read it. Knowing from the blurb that animals would be harmed, I calmed down as soon as I met the old badger in the first chapter. He knew things weren’t going to end well, but he had a job to do and he was courageous. It helped knowing him. The book also has issues, which is another thing I’m not dead keen on, but this is handled so well that it just makes you happy and satisfied. Nicky (I’m not sure of his age. I’m guessing 13?) has to look out for his brother Kenny who is ‘simple,’ as their dad is in a bad state after their mum left. Then there are the local teen thugs, with their dogs. And there are the badgers. You can imagine. But good can come from bad, and it does. I almost cried. 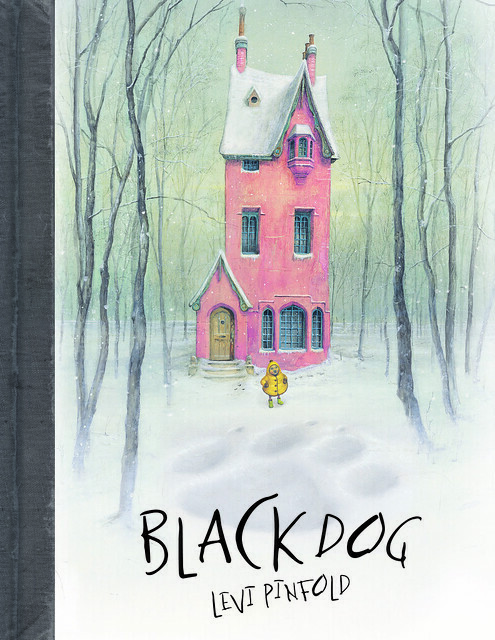 Levi Pinfold’s lovely book Black Dog is a more than worthy winner of the Kate Greenaway Medal. It is beautifully illustrated and beautifully made, with a soft, mother-of-pearl kind of cover, that just begs to be stroked. The pictures are a little in the style of Shaun Tan, with a dash of Oliver Jeffers, and you can’t go wrong with that. The Hope family live in the most wonderful and strange house, and at times I almost forgot the story, because I was so fascinated by what their house looked like. One morning Mr Hope discovers a black dog outside the house. It scares him, and he over-reacts quite a bit. Then Mrs Hope sees the dog and does likewise. Each time someone in the family sees the black dog it grows, and so does their fear of it. That’s until the very tiny Small Hope takes charge of the situation and shows her family that there is no need to hide. By the time she does so, the dog is Very Large Indeed.